So, how much do you know about the mandolin? If you are anything like me, not much. 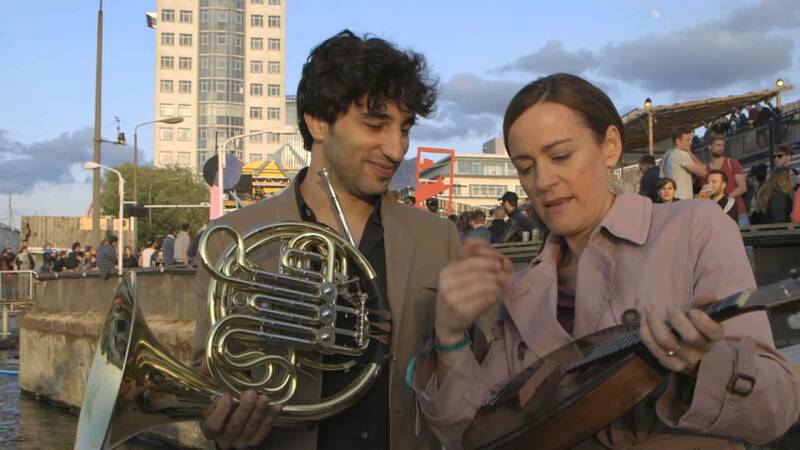 But a day with the Israeli mandolin soloist, Avi Avital, changed all that for me! I wanted to make it a real Berlin-Day, so we started at the Brandenburg Gate. Avi was a dream to film with, he got his mandolin out wherever I asked him to and would strum away and charm the tourists and the Berliners while I talked into the camera. He made everyone smile around him – with the exception of one grumpy policeman who wanted to have us all arrested…we weren’t exactly sure why. Being Sarah-naded by Avi with ‘Life is Beautiful’ in the rickshaw was one of my highlights of Sarah’s Music so far and our Plucked Instruments Picnic was so much fun. The Berliners in Monbijou Park didn’t pay much attention to Vivaldi but all heads turned and phones came out when Avi started playing the famous mandolin solo from REM’s ‘Losing my Religion’. Check out the outtakes for more REM and Sarah-nading! We spent the evening at the Berlin Festival – a big techno music event at the Treptow Arena. Definitely not your usual classical music event but Avi was performing for the Yellow Lounge, a series of concerts which promote classical music in unusual venues. This venue was definitely not your usual classical music venue what with the throbbing of the techo beats and the enthusiasm of the party-goers. People were intrigued when they saw us outside with the mandolin and the cameras and said they would come to come to Avi’s concert later on that night, even though noone we talked to said they listened to classical music normally. But that’s the whole point of the Yellow Lounge. Avi’s two concert sets were great. I didn’t envy him up there – the first one started after 11pm, the place was smoky and dark and by then the techno-fans were pretty ‘happy’. We had ravers dancing to Vivaldi and saying how cool it all was. Basically you could behave how you liked during the concert but I had the feeling people were really listening and enjoying the music. It helped of course that Avi is gorgeous and has such a good stage presence! I can’t imagine a better ambassador for the mandolin than Avi. I love what he is doing in bringing the mandolin into the concert halls as a solo instrument and performing with such a passion – he now has fans all over the world. If you can get to see him live, do go to a concert and make sure you smile for one of his now famous ‘View From the Stage’ photos afterwards. Thanks, Avi, for a great day in Berlin with you and your mandolin. I am now officially a mandolin – and Avi – fan!